I immediately realized that I had said, "I am waiting for my wives. Four of them." Anyway, once my wives joined me (one of whom turned out to be male), we were seated in a flash, and we immediately ordered some wine. We initially ordered some Rosé and a Côtes-du-Rhône, but when I saw their wine special, a Cahors, I dumped the Rhône in favor of some French Malbec. Malbec is one of the darlings of the wine world, thanks to its success in Argentina, though it's popularity isn't as robust among retailers as it was a couple of years ago. This is because it is easy to grow weary of a popular wine, and a common sentiment arises..."Oooh, another Argentine Malbec...." Enter Cahors, a region of southwestern France where Malbec is the required principal variety. Cahors was widely treasured in the 19th Century, in part because of its longevity. The region fell on hard times when the phylloxera louse destroyed its vineyards, and it has taken nearly a century to recover its mojo. Cahors is literally awash in good wine these days, as was evidenced by the very good wine offered as a special at Chartier. 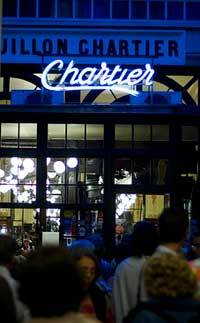 Chartier is a spectacularly ebullient restaurant with an atmosphere so infectious that even a morose teenager would be delighted. Shoehorned onto a table for four, we started off with the bottle of Rosé (despite the 30°F temperatures outside, it was like the sunshine we hadn't seen for a while), the name of which I couldn't tell you, and we continued with the Cahors, which was called Noir de Casteyrac (it is almost certainly unavailable in the U.S.). The Cahors was particularly satisfying, because it was really delicious and complex, and it cost the equivalent of $20! Find me a wine this good in a U.S. restaurant for this price and I'll show you someone who's losing money! It was a hearty, robust, slightly rustic wine that was a fabulous partner for the lamb and rumsteck that we ordered. 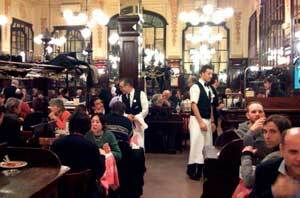 It overwhelmed the other two dishes, free-range chicken and Choucroute, but no one complained, because the experience of the restaurant itself obscured this small weakness. If you can't find any Cahors, then get your retailer to order some. Cahors has been on a upward trend in quality for a century, and since at least 1998, early-drinking wines have become commonplace, so really no one has any excuse for not stocking at least one (unless even their wholesalers are afraid to stock it...). It takes a little bit of imagination to sell it, I mean, who the heck has heard of Cahors? Oooh...there's the sales opening right there! I tasted a handful of excellent estate-bottled Champagnes last week that were magnificent. Champagne is synonymous with luxury, and that is largely thanks to the masterful worldwide representation of the region by some famous name Champagne houses. The wines that I tasted were certainly luxurious, but as far as Champagne is concerned they were a bargain. Of course, we're talking about Champagne, so the idea of what is a bargain is rather skewed. Land costs more in Champagne, and getting the grapes off the vines is not cheap, and of course the process of making sparkling wine isn't terribly inexpensive, so all this conspires to bring the price of Champagne up more than anyone would like, but there is certainly no Sparkling Wine better than a first-rate Champagne. Jean Milan Carte Blanche--a spectacular Blanc de Blancs (i.e., all Chardonnay) that is even drier than it has been in the past. I have tasted this wine many times through the years, and I am newly dazzled by the purity of its expression, which was--once upon a time--sort of soft and diffuse because it had more sugar (more along the lines of Veuve Clicquot, which is itself technically a dry wine, though it tastes rather sweet to me). This is more vivid than it was formerly, and would be well attuned to some fine oysters, or caviar of course. René Geoffroy Cuvée Expression--A dynamic little spice bomb...at least the nose gives that impression. I understand that this wine has more Meunier than Pinot Noir, which probably accounts for that and the strawberry-rhubarb quality in the background. It has an excellent earthiness in its flavor profile--an excellent drinking experience. Vilmart Grand Cellier--all the tell-tales of a luxury cuvée: broad-shouldered wine with long, robust flavors which leaves a Great Impression. Barrel-fermented, so this significant character is going to be a feature. It has a silky plushness yet is well defined and pointed. Has a brioche quality that keeps drawing me back to the glass, do doubt because it is a suggestive flavor, not an obvious one. Remains one of my favorites, and isn't priced like the luxury cuvées at about $70 (I know, I know--that's no small purchase, but other luxury Champagnes are over $120, so it's all relative). Jacques Lassaigne Cuvée le Cotet--Also a barrel-fermented Champagne, it is not as vivid as the Vilmart, but it is also $20 less. It is a richly appointed wine, beautiful in its expression of a pain au chocolat series of flavors--croissant and chocolate that are continuously emerging over each other--a very cool effect. A really wonderful wine. H. Billiot Rosé--A wow wine for sure! Rosé of Champagne is typically more expensive than its white sibling, and this one is around $70, as I recall, but it's dynamite. This wine is historically made with a small percentage of still red wine to make your glass rose-colored, and its red-fruit qualities are hard to beat. This is usually one of my favorite Rosés of Champagne, and judging by the fact that I didn't feel like writing anything down because it was so captivating, it remains so. I tasted several Oregon wines yesterday, most of which were new to me, and all were great. I'll review a couple of other wines from the tasting later, but I'll start with the wines from R. Stuart, which were easily the class of the tasting, because not one was disappointing, and they easily had the best price:quality rapport. Big Fire Rosé--a beautiful, bright rosé, one of among many from Oregon, but this one is a standout. Vivacious, long flavors of rhubarb and black raspberry--I'd drink this at Thanksgiving. It's a steal at $17. Big Fire Pinot Gris--A ragingly flavorful Pinot Gris, full of character and purity of fruit--this seems to be a hallmark of the Big Fire wines: nothing interfering with fruit expressions in any of the wines (see the Pinot Noir for more). This one has an undercurrent of cream that keeps the fruit broad, expanding the stone-fruit flavors. Another great value at $17. Big Fire Pinot Noir--these days, this level of Pinot Noir from Oregon is generally one dimensional and doesn't have enough succulent fruit to be satisfying (for me, at least), but this wine blooms and soars with fresh cherry-toned fruit and an underlying moodiness that is hard to pin down...but why would you want to? It is enough to enjoy its mystery, and for $20, that's something special. R. Stuart Pinot Noir Autograph Willamette Valley--This is the most 'complete' wine of the bunch. Broader and much deeper than the Big Fire (which is not shallow to start with) this wine contains fruit from all over the central Willamette Valley. It is not as immediately enjoyable as the Big Fire PN, as you'll have to wait a few minutes after pouring a glass to really get the best of it. One can easily detect the elegant detailing of breadth and richness right off the bat, but it gets better with every sip. The sensuous and persistent fruit expression makes it an excellent holiday feast wine. Given its quality, it is not much of a commitment at $35. ...or: How Long Do You Age Your Rosé? I conducted a little mini-tasting on my deck today--we don't get such beautiful days here often...besides, where else should one have a tasting of Rosé? I opened six wines: 2008 Muga, 2007 J.K. Carriere Glass, 2005 Domaine Ott Château de Selle, 2004 Château Musar Cuvée Rosé, 2003 (!) Pascal Cotat Sancerre, and 1998 (!) Domaine de la Mordorée Tavel. The idea was to have some wines with presence, and to see how they held up. Hard to rank these, given that they were all sensational. I bought these over the past five years, after having tasted them in their youth, so I was predisposed to like them--take that at face value. I knew that the older ones should hold up, and I am happy to report that they did. That the Mordorée Tavel was brilliant was not a shock, but it was so warming and suffusing that I didn't relate to it much as a Rosé--it had taken on a life of its own, in much the way that older Alsatian Muscat does (where the orange blossom scent is gone and replaced by caraway, which gives it a quality of ancient wisdom in a package that still seems youthful). It had a curious meat-juice quality that was so fresh and deep that my first thought was of the Grilled Duck Breast Salad I used to get at one of my previous restaurant jobs. I suppose that I was drawn most closely by the Cotat Sancerre Rosé. It has some red wine characteristics, and as it warmed up, it displayed more of that tone, and this is not uncommon with Pinot Noir rosé. It never lost its rosé-ness, however--there was an ineffable notion of sunshine through it--and yet it was six years old. A year ago I wrote that the '04 from the same producer was the best Rosé I had ever had. This doesn't top that, but it's smashing wine that supports the legacy of quality from this estate. Domaine Ott releases this wine a vintage behind the current wines in the market, and I bought it in the fall of 2007. It was moody (for rosé) and deep, possessing traits akin to white Burgundy, which is the style cultivated by this estate for this wine (they have others that are more crystalline and gossamer, but Château de Selle is their "serious" wine), and it was perfect for a day like today. Had it been hot, I would probably have enjoyed it anyway, as the weight of the wine is not its main feature, but because it is barrel fermented, its edges are more integrated. J.K. Carriere was a sensational delight, again. I am amazed by this wine and its depth of flavor and richness of texture. Other than because it's rosé of Pinot Noir, it has these qualities because Jim Prosser, the winemaker/owner of J.K. Carriere, dumps Chardonnay lees [lees are the dead yeast cells, grape skins, seeds, pulp, et al., that settle to the bottom of a fermentation tank when fermentation is complete] into the wine, giving it that creamy texture and moody aroma. If you can lay your hands on some of this wine, I would do it. Chateau Musar was fabulous. I have heard that it is entirely Cinsault, but I'm going to have to look that up. Current vintage is 2005 (in this market, anyway), and I believe the '06 is on the way, so this '04 is a bit behind, though not really by Musar standards. It was still fresh and lively, and it had an exotic, heady aroma, which I enjoyed greatly. I have come to expect this in Lebanese wines...I would like to see them achieve better market penetration. Dark color--I've had some some Pinots Noir from Germany and Alsace that aren't this dark! So I had all of these wines with a lunch of Italian bread, Caprese salad, and some balsamic-marinated portabello mushrooms, and the pairings were remarkably reliable. Only the Muga and the Tavel tangled with these, and for differing reasons. The Tavel's acidity was not prominent, and so it bucked against the mushrooms, and the Muga tasted fine with the Mozzarella, but not so much once the tomatoes were introduced. All this tasting was done with the swirl-sniff-sip-spit method, of course, but I did return to the J.K. Carriere for an actual drink of wine. There's always an exception to every rule, but I hope we can put to rest the notion that Rosé doesn't age.... The lion's share of RosÃ©s don't age well, so perhaps it would be better to say that some RosÃ©s improve with age. The task is to find them.